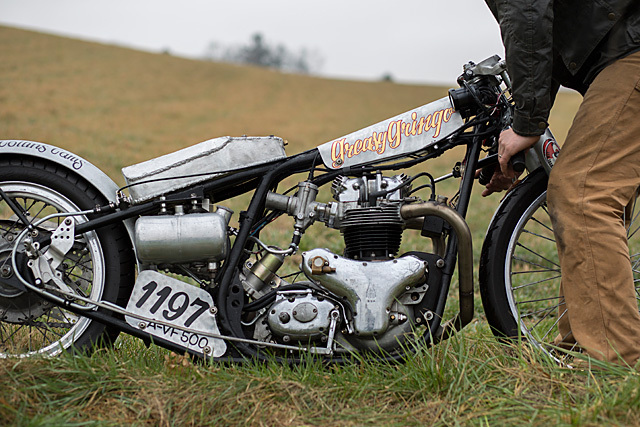 Land Speed Racing gets into your blood. Once there, it digs down deep into your veins, stretches its claws and releases its barbs. It stays with you for life. That has to be true if the 100+ years of man and machine racing down abandoned runways, across salt flats and hurtling over hard sand beaches has taught us anything about this sport and those who compete in it. For once they’ve completed that first pass, success or failure, they spend the rest of their lives tinkering, designing and building new parts and machines that will get them even that extra mile per hour faster. 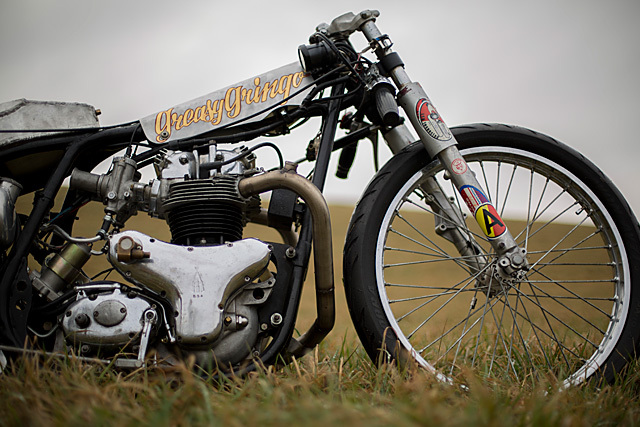 Dan Daughenbaugh and his ’51 BSA Star Twin ‘Greasy Gringo’ are no different and he’s the first to admit it – “It sounds like you’re crazy”. 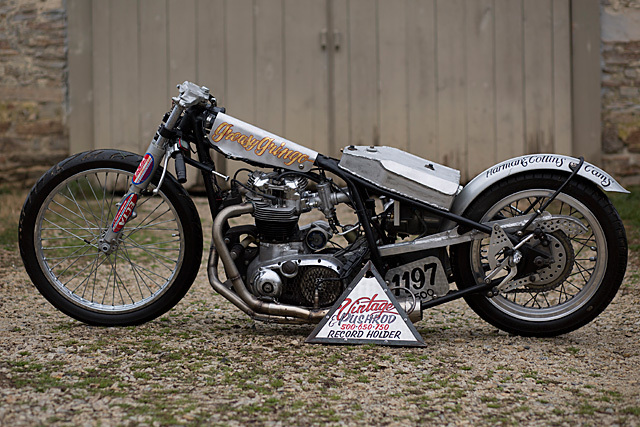 If you think you’ve seen Dan and the Greasy Gringo before that’s because it was featured here on Pipeburn a few years ago, but as with any racer that time has been spent upgrading the bike, building new parts and racing in the pursuit of going that little bit faster to break records and beat the competition. “Over the past 2 years since we have spoken, myself and team have been racing successfully at several events around the US. Namely the East Coast Timing Association standing mile events in Ohio and Loring Timing Association mile and a half events in Maine.” But every racer, his team and their vehicle go through a journey over the course of even a day, let alone two years and there’s been a host of highs, lows and changes to update the Greasy Gringo story. Not long after the original article was published Dan and the team headed to the Bonneville Salt Flats for the 2014 Speed Week “only to find the salt flats flooded with 10″ of water! We hung around for a few days waiting for it to clear up but it never happened. 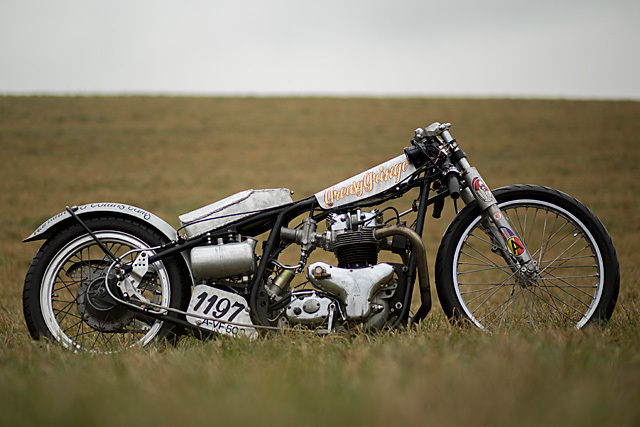 We returned home broken.” Making things that much worse was the fact that the film crew following Dan making their crowd funded documentary “A Line in the Salt” had headed to Bonneville too in the hope of capturing an SCTA record-breaking run on film. But despite the set back, filming continues and they’ll be there to get those winning shots, which could have been the 2015 Speed Week but once again the event was cancelled due to rain and mud. But despite the devastation of two years cancelled in a row that doesn’t mean Dan has been sitting idly by “As far as racing to wrenching, if you want to give a ratio, it must be a million to one” and that time has been spent with more internal changes, aero improvements and fixing worn out parts. 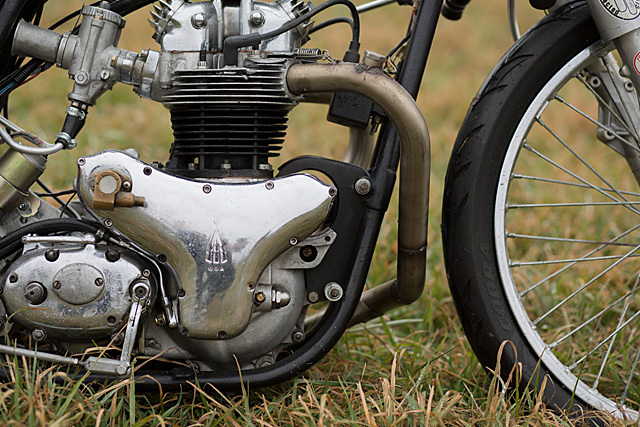 The Methanol/Nitromethane gulping motor running a whopping 13.6:1 compression ratio requires a lot of fuel to cover the distance of a Land Speed run and the engine was beginning to develop fuel starvation issues around the 7/8th of a mile mark. 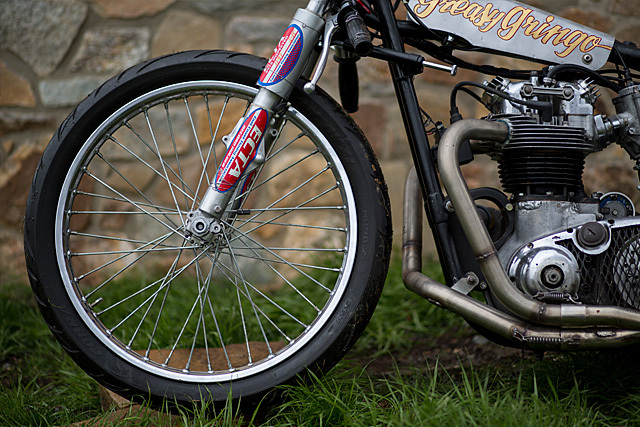 “It was a real head scratcher but there is now the floats and a half of a 4 barrel carburettor under the seat. I had to machine an aluminium plate to accept the Holley float bowl this now calls under the seat home and fuel starvation is a thing of the past”. 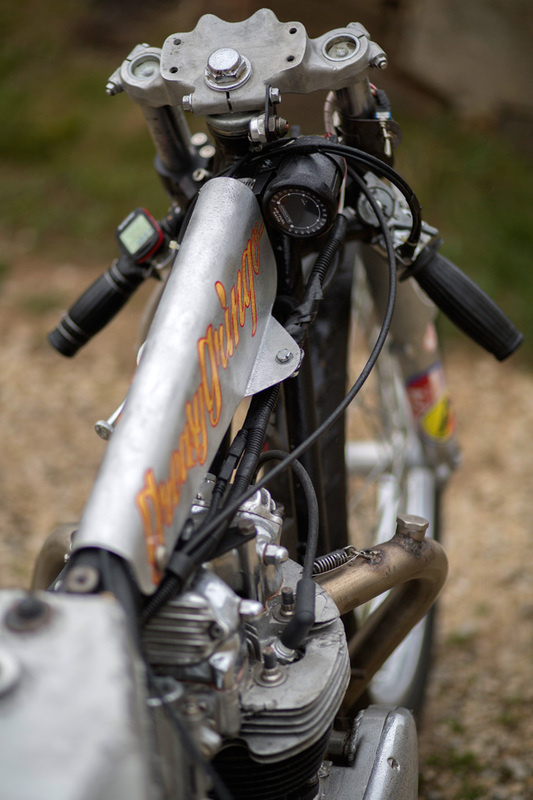 There is also a new in-house built stainless 2 into 1 exhaust, Dan’s own adjustable key ways in the cam gears to allow the cam timing to be changed while the motor is assembled and an in-house machined final drive sprocket to allow for the use of a 520 chain. Aero is huge in Land Speed Racing, many of the overall record holders barely resemble cars or motorcycles and have much more in common with a missile that happens to have a human being stuffed inside. But Greasy Gringo has to adhere to the rules of its class and as Dan explains “ It’s very hard to gain any advantage when the rules are so strictly written”. The gas tank has been moved and now forms the seat “This allows me to really lay down on the bike at speed to get out of the wind, nothing like a seat filled with nitromethane right under your jewels.” The clip-ons have been turned around and down to get them out of the wind and the front suspension lowered 2.5inches to reduce the frontal surface area. 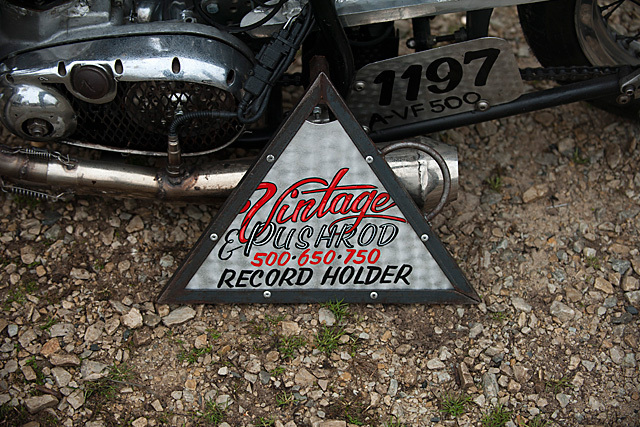 It means Dan can send messages to his suppliers and friends like C5 Ignitions “Just packing up at the ECTA MONSTER MILE set 4 records with and a best ever speed for us of 95.765 on a 84.412 mph record in A-VF 750” It’s one man’s love of vintage British bikes that set this all in motion, but even with Dan as Mayor, this community of speed freaks are sharing a journey around an old BSA that was once a roasted and toasted mess in a Philly fire. 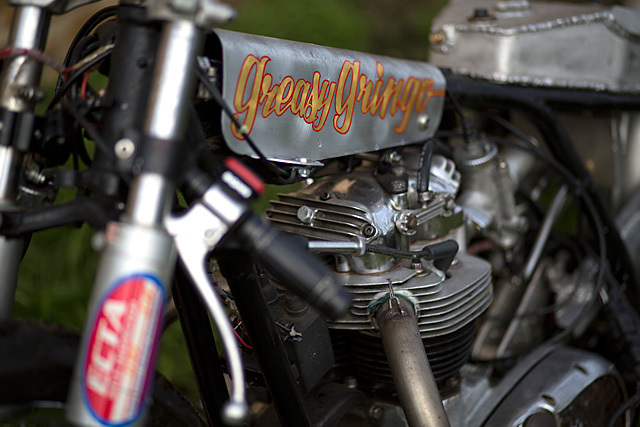 An engine running the sort of fuel that Greasy Gringo slurps needs the ability to consume very large quantities of air for it’s given swept capacity and cylinder head improvements are a constant talking point. The spring setup alone is a mix of BSA, Ford, and Triumph parts and now sports larger intake valves from a Triumph Trident with larger valve seats and some port work performed by VAC Motorsports a local BMW performance car shop. 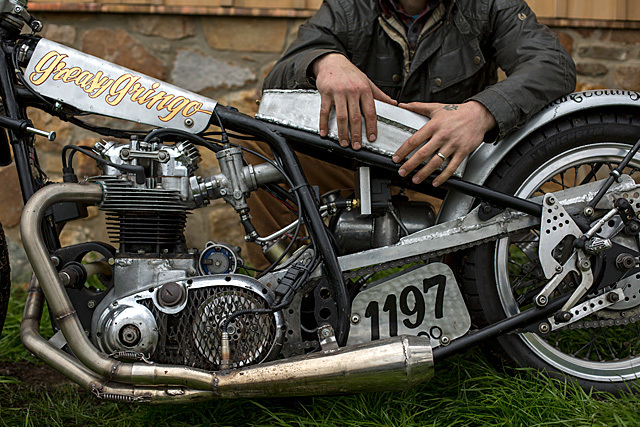 As Dan says, “Any little bit helps right?” and it’s this constant refinement along with his collaboration with like-minded folks that makes the Greasy Gringo story every bit as engaging as that of Burt Munro and his Indian.